Another month, another film from the Shaw Bros Shaolin cycle… Except this time we have Shaw’s other prolific director at the helm. While many associate the Shaolin cycle with Chang Cheh, Lau Kar-Leung inherited the mantle in this stellar 1977 effort, which further chronicles the life of Chinese folk hero Hung Si-Kwan, played as usual by the magnificent Chen Kuan-Tai. But this film differs greatly from the concise, historical-based efforts of Chang Cheh, who placed the focus on patriotism and brotherhood against the occupying Manchu forces. Lau Kar-Leung, ever the cinematic ambassador of Chinese martial arts, instead shifts the focus to Hung Si-Kwan’s development of his renowned style, Hung Gar kung fu. Let’s face it. Lau Kar-Leung made films for kung fu nerds. (This review will also be geared towards that crowd, so don’t feel too bad if a lot of this technical / historical gibberish leaves you scratching your head.) Don’t get me wrong, the classic revenge tale that this film tells can be appreciated by even your most casual movie fan, but to really reap the benefits of what Executioners has to offer it helps to understand some of the finer points of kung fu styles and martial technique. Hung Gar is comprised of both tiger and crane techniques. The tiger being a powerful external style based primarily on brute strength while the crane relies more on deft movements and pinpoint accuracy. 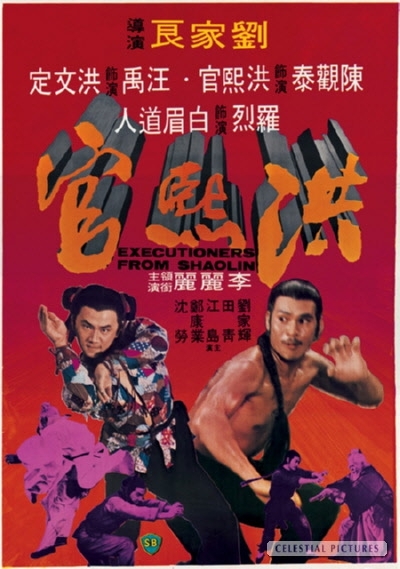 Executioners from Shaolin tells what I’m assuming is a mostly fictional tale of how the tiger and crane styles became united under one banner.